Wiki describes Locavore as “a person interested in eating food that is locally produced, not moved long distances to market. One common – but not universal – definition of “local” food is food grown within 100 miles (161 kilometres) of its point of purchase or consumption”. Although not strictly a Locavore, I like to source food as locally as possible or know its provenance. Locavore is great in principle, but not always do-able in reality. Dividing our time between 2 locations 500 kilometres apart as the G.O. and I do is similarly great in principle, but not always in reality. In the last six weeks the G.O. and I have made 4 trips north; first to the Hunter Valley for my youngest half-sister’s baby shower; last to meet my niece ( …first grandchild for my family) born on my half-brother’s 30th birthday. In between we’ve made 2 trips to our house at Taylors Arm for Easter and ANZAC Day. In order to drive to Taylors Arm for ANZAC Day we had to get through areas of the Hunter Valley which experienced a deluge during that week. The G.O. had a skin cancer removed from his face and 3 layers of 15 stitches immediately prior to our departure and we were delayed in traffic for 2 hours but managed to get through before the highway was closed due to floodwater across it. I wouldn’t describe our time at Taylors Arm as relaxing or recreational, rather productive but it gave me the opportunity to stock up on local Nambucca Valley produce. Knowing we were heading off to Taylors Arm my family had put in their orders for lemon myrtle soap and macadamias. It was great to visit and chat with Michelle & Peter from Perry’s Lemon Myrtle and Mariana from Gruber’s Winery just down the road. As well as using lemon myrtle soap bars in the shower; I grind the soap up, adding water & glycerine and heating in a saucepan to make liquid hand soap for the kitchen and bathroom. The G.O loves a visit to the MacNuts shop in Macksville and samples the flavoured varieties of macadamias thoroughly while he waits. 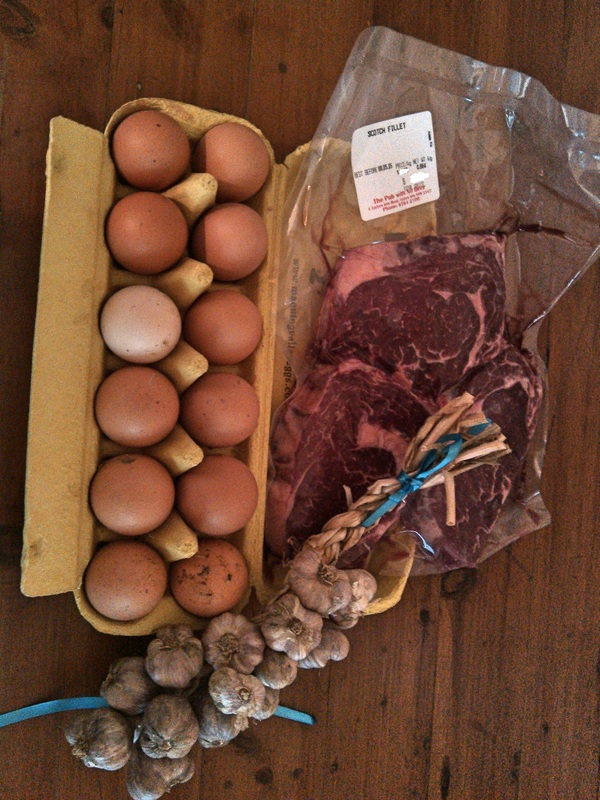 I also strolled down our main street to The Pub With No Beer and bought beef & eggs locally grown by the new managers, the Welsh’s who are the G.O.’s cousins, and local garlic grown on the village outskirts. Best of all our RHS neighbours shared with us bananas they had been given that were grown nearby, some of which I exchanged for one of 3 pumpkins anonymously left on LHS neighbour’s doorstep. There were also a few choko’s remaining on the vine along our RHS dividing fence, which I grabbed as I like them (a bit smaller preferably) and even though the G.O. detests them, he’ll cook them for me on the bbq. We return to Sydney laden with products from our Mid North Coast home, and fortunately online shopping enables me to replenish at a few of my favourite places both local & non-local: Perry’s Lemon Myrtle; Nambucca MacNuts; Kombu Wholefoods; Daintree Tea, even if I’m not able to visit in person. Other local Mid North Coast favourites also available further afield at farmers markets or via distributors are Burrawong Gaian Poultry, Ausbuff buffalo products, and Booma Boers who are at my local Sydney Eveleigh Farmers Market. Booma Boers goat products are also available at some Woolworths supermarkets. This entry was posted in Blog and tagged Australia, food, in my kitchen, my life. Honey from the Honey Place in Urunga, vodka from Red Dirt distillery in Dorrigo, smoked trout from Ebor… You’re right, the mid North Coast has a lot to offer if you want to buy and eat local. Good thinking, I must get Red Dirt Vodka for our oyster Bloody Marys. Honey we get from the Gruber’s… I love that it comes from local flowers… terroir! When I was a kid growing up in Murrurundi, Dad was big in the local Fishing Club and we made many trips to Ebor Hatchery for fingerlings that then were released locally. We’re well due for a trip over the mountain. We also love Raleigh Winery, and have http://www.mayfieldfarmproduce.com.au/ at Dorrigo on the to-visit list. What are chokos? I do enjoy seeing your shopping! I’ve just been out to vote and also shop 12 miles away for a treat at the only supermarket company in the country that is a ‘good thing’ in my biased opinion. I took some pics and may just blog it later. Hope the GO is doing better now. According to Wiki choko is “An alternate name for Chayote, a green vegetable of the gourd family”. In Australia they grow in many backyards, typically along the chook-yard wire. They are a somewhat old fashioned vegetable but still available. Choko’s are popularly used in pickle making (and were once rumoured to be secret ingredient (sweetened) in Macca’s Hot Apple Pies. As an accompanying vegetable they can be boiled, steamed, baked or sautéed but I like them tiny & barbequed as this way they caramelise. On the radio this morning the news suggested the Conservatives will get back in. Only thanks to you did I have a clue of the significance of that. 12 miles qualifies as Locavore! Delicious too I hope. Thank you the G.O. is fine, the cancer a BCC wasn’t malignant, the plastic surgeon did a great job as the scar was inperceptible… although his beard growing back renders that moot anyway. Now sausages would be a real reason for voting – yum! Must share this on FB with my dejected friends. I wish I could taste some of that great produce you bought and please can you send some of that rain over here. We need it . Our farmers markets are brimming with fresh vegetables , fruit, fish, meat, and the best bread ever, baked here in Santa Cruz. Tomorrow, are going through the Central Valley of California where huge farms grow fruit and nuts. I will stop at some of the fruit stands , although, I prefer our small organic farm here on the coast. I’ve been reading about the drought in California – devastating. The east coast of Australia has had no shortage of rain. A week after the Hunter Valley, the Mid North Coast was flooded but at least they were expecting it whereas it hit the Hunter Valley unawares. I know what you mean but it’s a nice thing to do when travelling, to stop at the roadside stalls to sample local produce. At the moment the backyard is a construction zone, as the shed erection is in progress. Plus until we move we’ve put developing the garden into hiatus, as we need to consider convenience for our neighbour who does the mowing and already has to manoeuver around numerous trees. An olive tree or two are on my list – they won’t net anywhere near your yield though. We don’t have the space. We keep lists of stuff found in different locations, so it’s ready to grab if we decide to make a run. Thanks for the road pictures – heard about the flooding on the weather channel and wondered. A list is a good idea… I tend to think along the destination-food lines of “we’re going to X, so we can eat/buy Y” 🙂 A couple of east coast lows drenched most of the coast of NSW over a fortnight but very little made its way inland where it’s really needed. Umbrella manufacturers will be pleased; it was wild… I’ve never seen so many “dead” umbrellas. I’ve never heard the word ‘locavore’ so you’ve taught me something new. I love the end quote from Michael Pollan’s book, too. Did he coin the word ‘locavore’ and I’ve just forgotten it? I’ve read a couple of his books. Also we LOVE the macadamias you recommended, from Nambucca MacNuts–so fresh tasting, compared to what is available from either the groceries or the health food store here. What a very interesting IMK Dale. You two have been very busy! Hope all went well for the GO and he is recovered. I’m pleased you liked the macadamias… so much better than the tiny retail offerings of who knows what age & exorbitant cost. Our families love them… it’s quite hilarious to see how pleased & greedy looking they become when presented with a 1 kg pack. Thank you. The G.O. is fine. The BCC wasn’t cancerous and the plastic surgeon did a good job on the scar which will soon resume its covering of beard. What a great bounty of local goodies from Nambucca heads and up that way. Swapping excess food is a very good thing to do in the country and I suspect, when you make the move up there, that this will happen often. 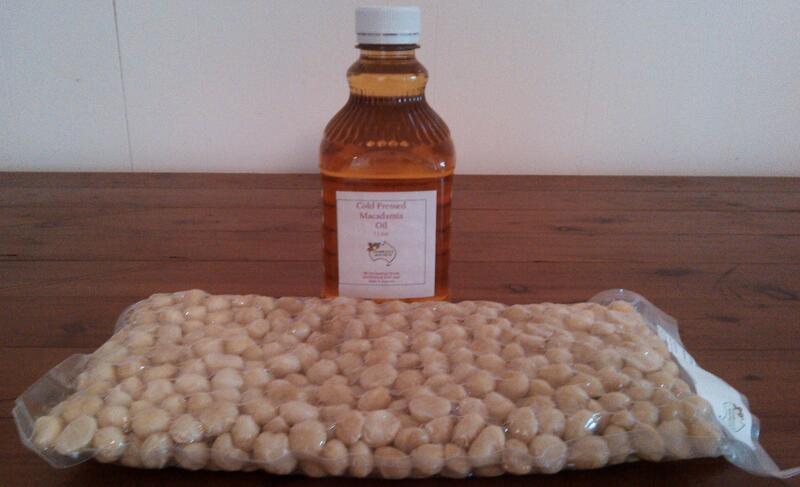 Must try those macadamias from Nambuccca. I love food exchange, and was pleased I had the bananas to reciprocate with LHS neighbour. I also shared them with my MiL, my sisters and made banana bread for the G.O.’s smoko. Macadamias went to my family and the G.O.’s, and via her mother’s milk Nambucca macadamias and Taylors Arm bananas would have been in my niece’s first days of sustenance 🙂 The macadamia oil is great as well but unfortunately they don’t ship it. We didn’t intend to drive in the deluge. Had we known we’d have stayed put in Sydney or diverted to Dad’s or my sister’s. For days prior and on the day I had been checking LiveTraffic which said even as were sitting in the jam for 2 hours “no conditions to report”! The situation became apparent as we caught the end of a local news item, then the G.O. hooked up the 2 way and heard the truckies saying they were hanging in because the police had suggested the road would be closed if the water rose further. And it was closed later. We are fortunate in that neighbours or friends frequently drop things off. And we share too chokos, passionfruit and anything else anyone cares to pick from our yard. Thank you. Once he got the stitches out the G.O. was happy. It’s healed really well. Glad the G.O. is feeling full of bean again, and you’re lucky you have such good neighbours. Community makes such a difference yet here in the city we seem to have lost it, more or less. Thank you. A single cake of soap makes a large jar of concentrate liquid soap to which I add water to refill the pump pack. It lasts forever. Of course, there’s always the option of saving the soap slivers in a jar but mine are pretty skinny when I’ve done with them! Thank you 🙂 I do love the Nambucca Valley and was looking at the possibilities of it even before the G.O. and I got together. And now it’s home. I’m quite conflicted as I would like to see the area’s attributes shine in the greater world but not lose some of its shine by over-exposure. A delicate economy of scale. One of the best things about the Nambucca is that there is plenty of scope to make what you like here. One of the worst things is trying to generate enthusiasm. I love that quote from Michael Pollan. It’s sad that something as fundamental to human/family community as shared meals is being destroyed by our eat-on-the-run culture. As he puts it, from a ritual of family and community, to a mere biological act. Community as opposed to Corporate. Growing & sharing as opposed to purely commodified & transactional. Yet billions are spent on trying to convince us otherwise. We need some of that rain out here in Northern California! I wish the weather would even itself out a bit. Aren’t plastic surgeons amazing? Glad the skin cancer was not malignant. Thank you 🙂 IMK and life closely interacted this month. The G.O. acted early, and was fortunate. Love the Lemon Myrtle and I share your passion on supporting local produce and businesses too! Thank you for this month’s IMK view! Local macadamias, I am so incredibly jealous! I am more in ocean country and I don’t even like them. The soap sounds great as well. I love getting goats milk soaps at the farmer’s market. Last visit to Perry’s Lemon Myrtle we got chatting and had time for a tour. The lemon myrtle tree groves are lovely, and I like the creaminess the goats milk adds to the soap. You’ve really had a busy time of it recently. I hope the GO’s scars heal without a trace. It’s fantastic that you can get hold of so much local produce wherever you are and that you have a variety of Farmer’s Markets to choose from. Buying local produce and supporting local growers is so important. I hope you get to see more of your new niece and share some photographs. You’ll soon get used to the picking up and eventually the running after. we had big rain and floods in brissie too. so sad about the people dying in the floodwaters. i always love to find new produce wherever i go- such fun. not a huge fan of chokoes i must say:) but i guess you can use them in alot of dishes as they are flavourless and take on other flavours – just as tofu does. I was saddened and shocked to by the loss of life in the floodwaters. We wouldn’t had set out had we known the road was flooded. Fail to RMS in that case. Unfortunately the G.O. can detect the subtle flavour/texture of choko. But he likes tofu! Hi Sherry, I have been trying to comment to your May IMK… Blogger does not like me! I just wanted to say “My niece was born on the same day as the princess, so quite special and double excitement for us. I love your poppy dish, and will also keep an eye out for some of the goodies, particularly the olive salt and vanilla bean grinder. Thanks for mentioning all those local producers, I’ve bought from Macnuts but quite a few of the others were new, so some other places to visit next time we go north! It’s always lovely to hear about people who love their local produce but especially local produce we love as well. I must try a Burrawan duck. I can’t believe I didn’t give you any soap. I’ll remedy that!